William Shakespeare has had an incredible impact on the world we know today. His works have inspired artists of all kinds for generations. Growing up I read my first Shakespeare play when I was in grade six. My father suggested that instead of doing another terrible lip sync to whatever bubblegum pop song was my favourite at the time, I try a Shakespeare soliloquy. Selecting Mark Antony’s speech to Caesar’s lifeless body I became enthralled and the rest as they say is history. One thing that has always frustrated me concerning Shakespeare is what I like to call “the Shakespeare Wall”. People hear the name ‘Shakespeare’ and they go into a state of panicked illiteracy insisting they cannot possibly understand. It starts in high school and while some people overcome it, for many others it snowballs. 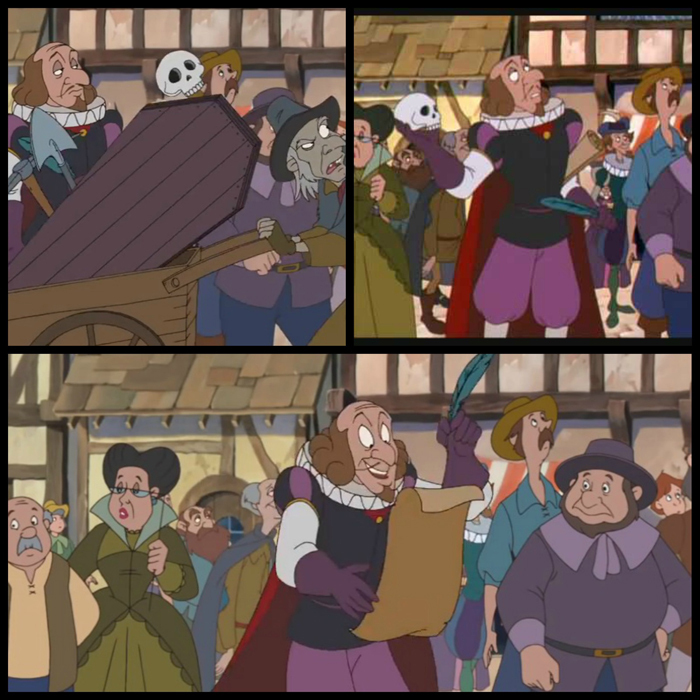 Yet while we may not all appreciate his plays in their original form I think we can all appreciate the amount of Shakespearean references woven into Disney flicks. This article will take a look at ten different Disney films and how they borrowed from the Bard. During Disney’s 1991 Release of Beauty and the Beast the villain Gaston uses a line of dialogue generally reserved for Lady Macbeth. During the mob song while he is riling up the villagers to go kill the Beast he says “Screw you courage to the sticking place” which is from Macbeth Act I. Scene VII, and parallels Lady Macbeth trying to rile up her husband to kill the king. When Beauty and the Beast was re-released they added the song ‘Human Again’ in after it’s immense success in the Broadway production. In addition to the song, there is a short scene at the end where Belle says “There never was a story of more woe than this of Juliet and her Romeo” as she finished reading Romeo and Juliet aloud to the Beast. He smiles and asks her to read it to him again. 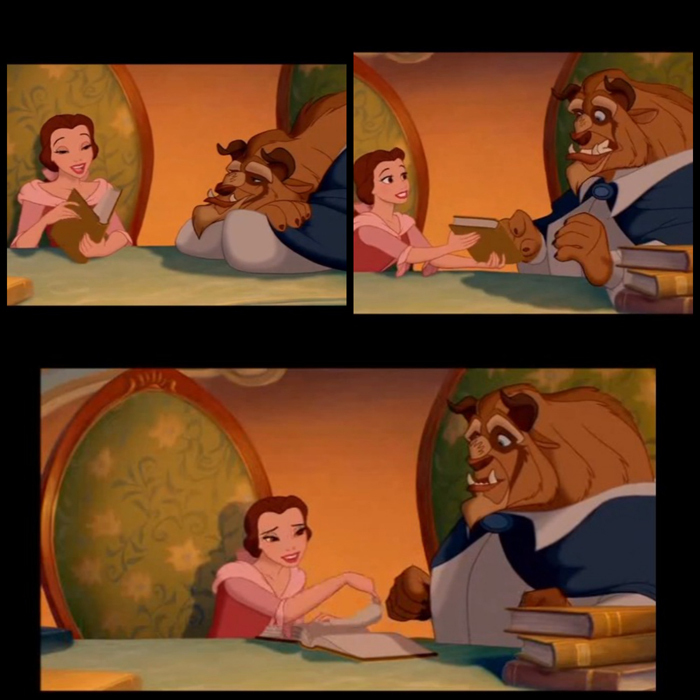 Here we learn that the Beast has never learned how to read, and Belle begins to teach him. It is only a thirty second scene, and it may seem trivial, but personally, I think those thirty seconds made the balcony scene at the end ever so much more beautiful. 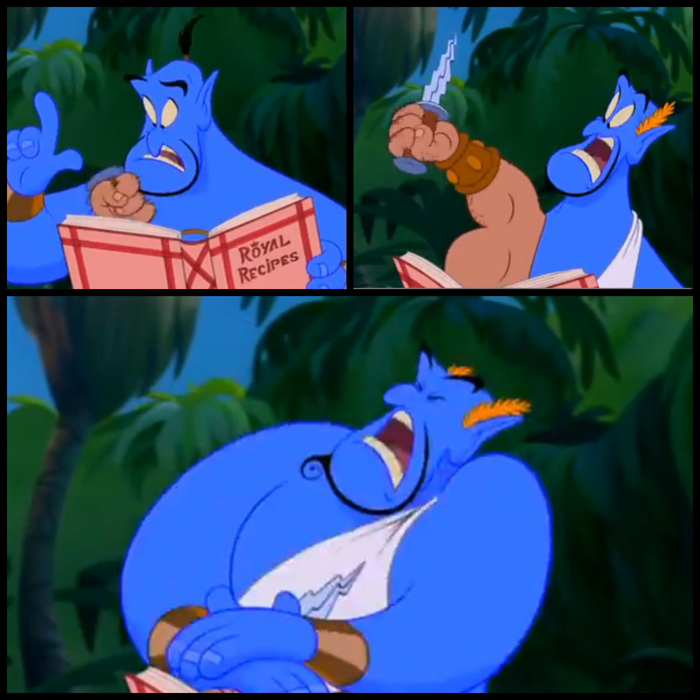 When Aladdin makes his first wish to the Genie – to become a prince, Genie runs through a magical spell book. Muttering to himself he says Caesar salad and an arm draped in a toga holding a dagger reaches out to stab him, to which he responds “Et tu Brute” and pushes the arm back down into the book and turns the page. This line comes from Julius Caesar Act III Scene I, Caesar’s dying words to Brutus. Another Shakespearean reference within this film is Iago, named after the character in Othello. In Shakespeare’s play the character of Iago is an extremely manipulative villain, although no one except the audience has reason to distrust him. Similarly, Iago to the sultan is simply a mimicking bird that eats crackers, and not someone plotting his downfall. The scene played on the television shows Macbeth during his monologue in Act V Scene V. “Tomorrow, and tomorrow, and tomorrow.” The hopelessness that Macbeth feels in this speech is strongly felt among the vagabond canines who know Sykes might arrive at any time. 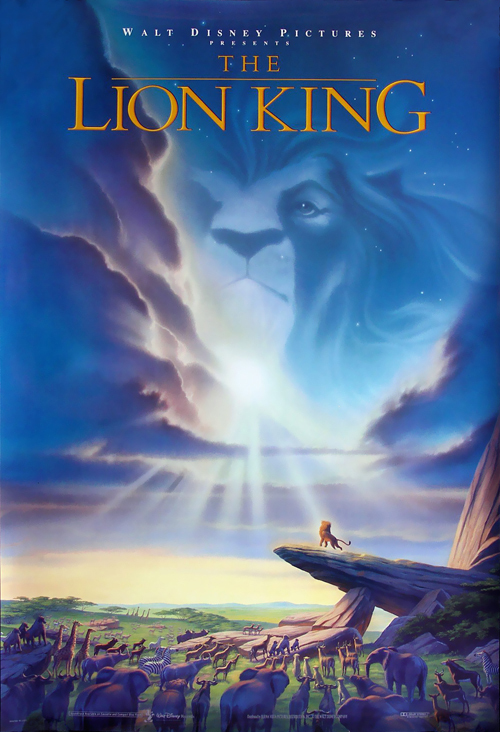 The sequel to Pocahontas, released in 1998, this movie took Shakespearean references to whole new level. Opposed to a line of dialogue, Shakespeare himself is seen singing with the townspeople in the song ‘What A Day In London’. As a gravedigger pushes his cart by, a skull rolls off the top into Shakespeare’s hand and he sings, “What is to be or not to be”, then as if inspired throws the skull away and begins writing on his parchment. In reality Pocahontas (already married and known as Rebecca Rolfe) arrived in England in June of 1616, while William Shakespeare died on April 23 1616. Despite its crazy inaccuracies and terrible music I always enjoyed this sequel, it’s story and the animation. 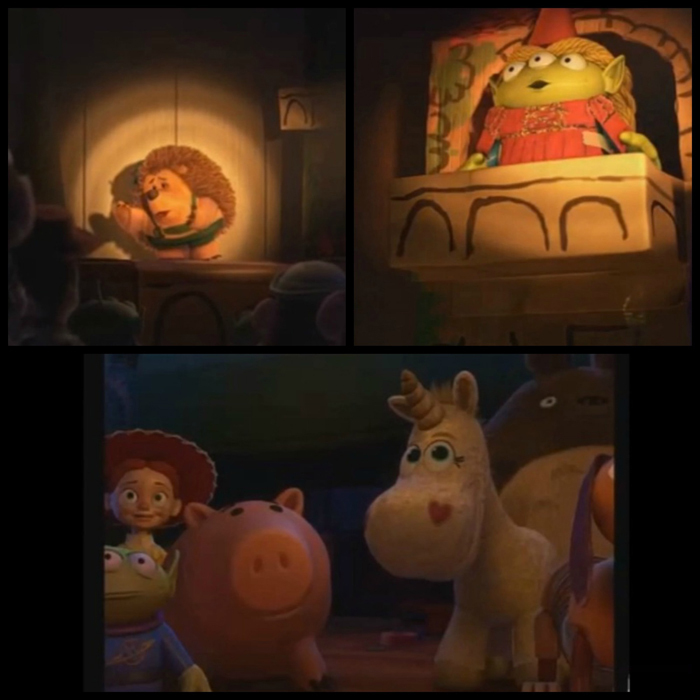 At the end of Toy Story 3 all the toys get together and not only reference but put on a stage performance of Romeo and Juliet. We see an adorable snippet of the infamous ‘balcony scene’ with a hedgehog as Romeo and a Little Green Man as Juliet. He quotes ‘But soft what light through yonder window breaks’ and the LGM quotes “Romeo oh Romeo wherefore art thou Romeo.” Both lines come from Act 2 Scene 2, one of the most famous of Shakespeare’s scenes. 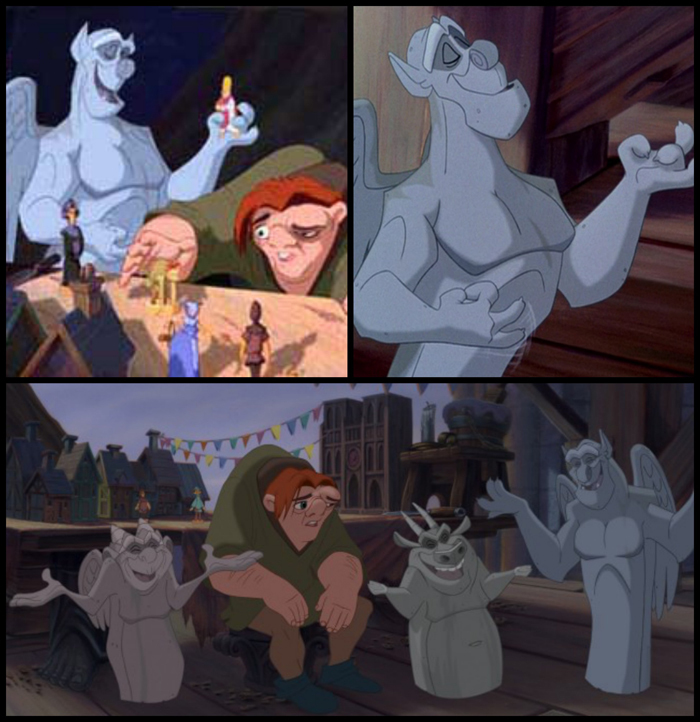 The Hunchback of Notre Dame has got to be the darkest Disney film on record. In fact without the addition of the three humorous stone gargoyles that come to life one might argue that it isn’t even a kids film. As a result the film is littered with references for the adults including a subtle nod to William Shakespeare’s Merchant of Venice. It is a particularly interesting reference considering that Merchant of Venice deals strongly with issues of racism between the Christians and the Jews and Hunchback of Notre Dame explores issues of racism between Frollo’s idea of the Christian Church and the Gypsies in France. While under the sea there seems to be little knowledge of Shakespeare, on land however even Scuttles managed to pick up a few references. Once Ariel has been given legs and is sent to woo Prince Eric, you might remember a cute little scene where they row out into this lagoon and Sebastian and all the fish sing ‘Kiss The Girl’. 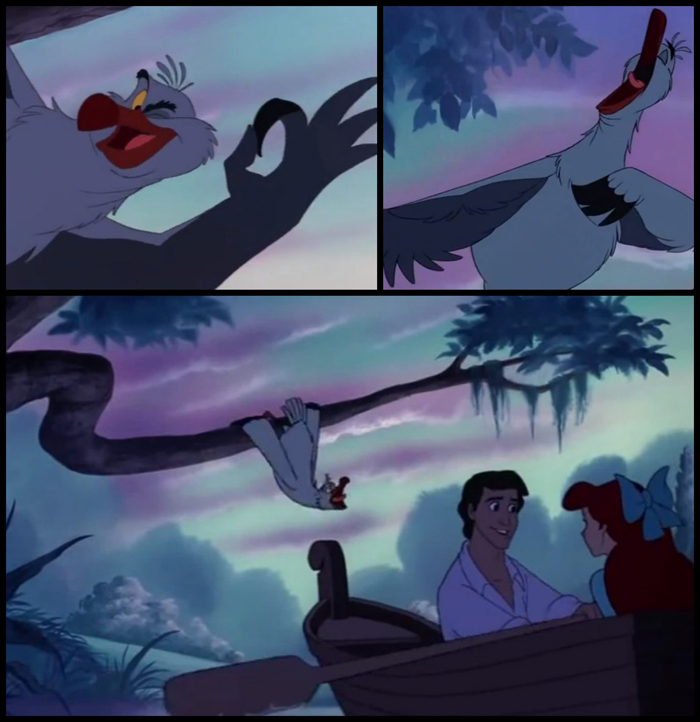 Well, before this, Scuttle tries to provide some “vocal romantic stimulation”. What you may not have realized is that this ‘stimulation’ is actually a gull version of Tchaikovsky’s “Romeo and Juliet”. An interesting parallel considering that this is an orchestral work of Romeo and Juliet without words, speechless, just like Ariel while in the lagoon, until Sebastian comes to help the two along. This particular Disney movie has been a fan favourite for as long as I can remember, but for those unfamiliar with it, the lead character is a skeleton named Jack Skellington. 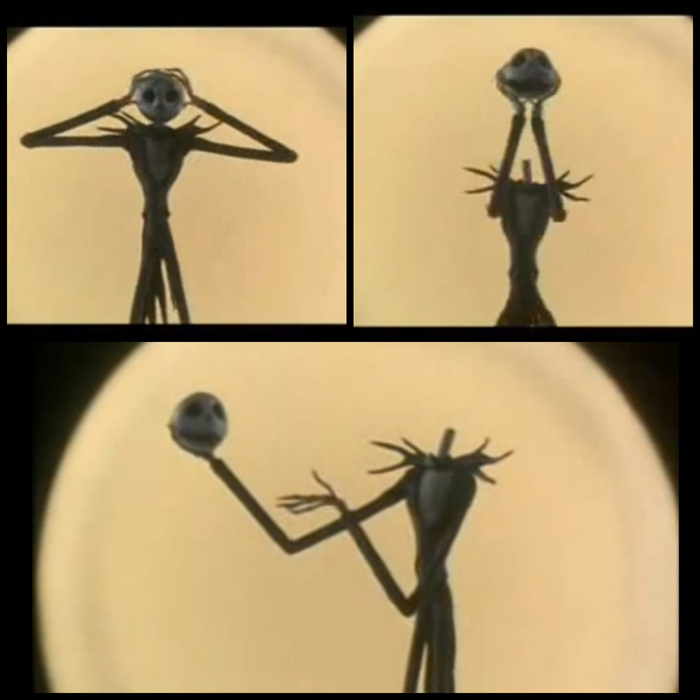 This movie, like Pocahontas II, makes use of the skull and during Jack’s Lament he takes off his head and sings, “And since I am dead, I can take off my head To recite Shakespearean quotations”, a reference to Hamlet. The reason that both of these films and countless other Shakespeare references in pop culture use a man holding a skull comes from Hamlet Act 5 Scene 1 also famously known as “The Gravedigger’s Scene”. In this scene Hamlet is holding his friend’s skull in his hand and proclaims “Alas, poor Yorick! I knew him, Horatio, a fellow of infinite jest, of most excellent fancy.” (I.V.160) This is probably one of the most common references to Shakespeare seen in pop culture and an easy one to make requiring only a skull at arms length. Thanks to high schools everywhere this Disney flick is now the most recognized homage to Shakespeare. The story is loosely based on Shakespeare’s Hamlet with a few less deaths. (It’s the Disney version, what else would you expect?) For those unfamiliar with the parallels Claudius (Scar) kills his brother the King (Mufasa). 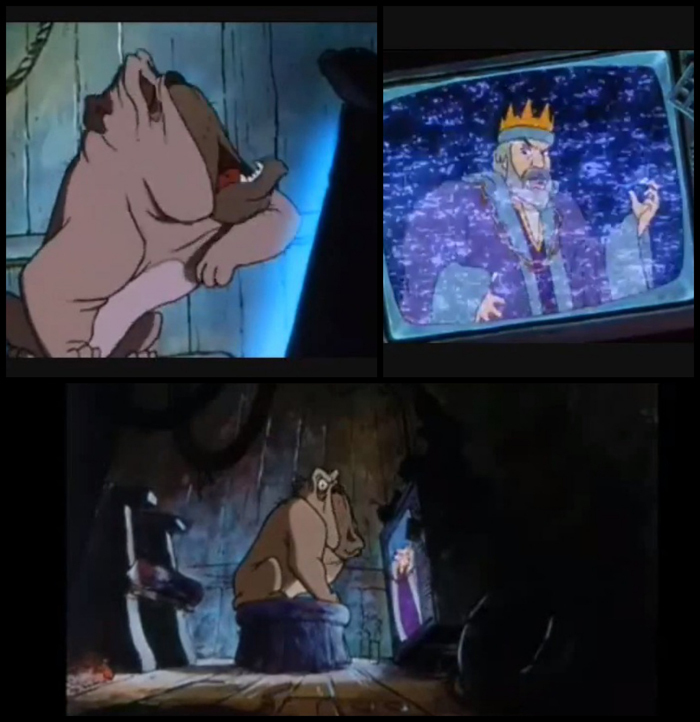 Hamlet (Simba) is visited by the ghost of his King father. He is led astray by Rosencrantz & Guildenstern (Timon and Pumba). He eventually returns to avenge for his father’s death and take back his throne. There have been many articles written about these parallels, a notable one here for those who are interested in delving deeper into this particular reference. When Kovu and Kiara are first found playing together by their respective parents Zira and Simba, it becomes clear that Simba is angry. He demands any relation of Scar’s is banished. He says, “You know the penalty for returning to the Pride Lands…” and Zira snaps back “the child does not, but If you need a pound of flesh…” and pushes her son forward. This is a reference to William Shakespeare’s The Merchant of Venice, where there character of Shylock, in a contract drawn up between him and Antonio states that if Antonio cannot complete the repayment as arranged, that Shylock will be able to take a pound of flesh from him. Shakespeare has influenced countless works of art, and is constantly mentioned in various forms of pop culture. So it comes as no surprise that the Disney world is full of tributes the bard. Of course some are much easier to spot such as the 2011 release Gnomeo and Juliet while others are heavily debated such as whether or not the three fates in Disney’s 1997 Hercules are a reference to the three witches in Macbeth. The Shakespearean allusions within Disney come in many forms from plot devices to quotes, and I’m sure the trend will continue into the future.